The bright LEDs are clearly visible even outdoors, and customers can choose from a wide selection of display sizes. The prefabricated construction enables signboard to be installed without the use of heavy equipment. Twin-colored high brightness LED guide lamps The guide lamp lights up red if surrounding blocks are full, and lights up green to guide drivers if there is at least one available parking space. The lamps are connected using four-core cable, making them simple to install. 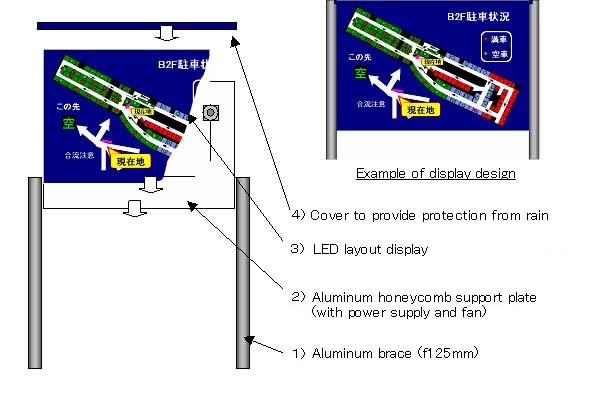 Twin-colored high-brightness LED guide lamps Like the LED signboards, a variety of layouts are possible. The LED lights up red if the block indicated is full, and lights up green to guide drivers if there is at least one available parking space. The high-brightness LED lettering can form a variety of letters and guide drivers by indicating overall availability by floor. The high-brightness LED lettering can form a variety of letters. This system is capable of displaying block availability and providing exiting information at junctions. Touch-screen computer monitoring panel As with the control computer, a variety of layouts can be represented and information on parking status displayed in real time.